Guringai Yoga Shala yoga school in Mona Vale on Sydney’s Northern beaches. With classes, workshops and courses in Yoga, meditation, Ayurveda - beginners to advanced. What is Guringai Yoga Shala? The beach at Mona Vale, situated in the indigenous area of Guringai. GURINGAI is the traditional indigenous name of the local area, of which Mona Vale is a part. We are not indigenous ourselves; this is simply our way to pay respect to the culture and the inhabitants that lived, and still live, here. YOGA is a state where individual consciousness merges with Cosmic consciousness. We, as Yogis, work towards that. SHALA means school in Sanskrit. Our primary intention is to educate you all about the Yogic path. Krishnamacharya, the teacher of our teachers, used the term shala to describe the place where he taught Yoga to his students. This is our lineage, we honour this ancient tradition and the man himself. GURINGAI YOGA SHALA is a school where you can expect traditional and authentic classical Yoga to be taught in small classes. We welcome you in our Shala, where you will learn all things Yoga and inspire you to explore yourself, energise your body and expand your mind. We are an earthy, even hippie community that like natural fibres, and vivid colours, and appreciate that each person has their way to learn and to grow, and their individual needs. We look forward to getting to know you. We do teach about the breath (a lot!) and Yogic philosophy impregnates every class. We chant. We apply mindfulness to all our classes. We are well trained, we practice Yoga and we teach from our own experience. Lastly, we LOVE your special conditions, needs and injuries, and we are honoured to apply our knowledge, the Yogic wisdom passed down through our teachers, our assistance and our CARE to your health. We are grateful for your trust. We welcome every body to Guringai Yoga Shala. 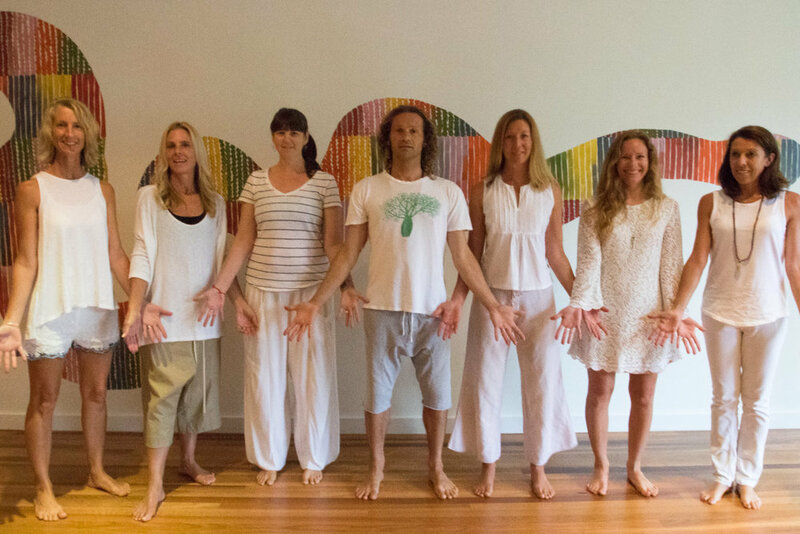 Journeys Into Yoga is our 500-hour Yoga Teacher Training program, starting a two-week Bali intensive, and followed up by four terms of classes, courses and workshops at our studio in Mona Vale. Our program is a departure from the usual teacher training programs, which often take a linear approach, separating the content into modules. Instead, our teachings immerse the student into an inner and outer experiential journey, with the teaching content ruled by the Five Vedic Elements. At Guringai Yoga Shala we offer small classes and traditional Yoga. We are inspired by the teachings of the ancient Yogis, and our classes include branches of Yoga such as asana, pranayama, meditation, Ayurveda, philosophy and more. We encourage our students to use Yoga as a way of entering their own sacred temples, and as a tool to allow deep listening to the wisdom of the body and the health within. Our teachers believe that Yoga is about discovering the various layers of truth as to who we are and the life we are meant to live. We offer a variety of classes and events, including Ashtanga, Hatha, Pranayama and Yin, and welcome students of all levels of experience from beginner to experienced. We really don't like getting lots of emails, so we promise not to bombard you. We'll just let you know when we have some new and interesting things coming up. Also, we respect your privacy and will never share your details with any other organisations.